When the credits rolled on The Master, I found myself thinking two things: Joaquin Phoenix is going to be nominated for an Oscar, and damn, I could use a drink! Watching Phoenix as feral Freddie Quell make moonshine from torpedo fuel, paint thinner and what appeared to be darkroom chemicals garnished with a mangy citrus fruit reminded me how inspiring it is to see a good mixologist at work. And that spurred me to find one who could invent a proper high-alcohol homage to Paul Thomas Anderson's movie and Phoenix's character that would not require masterminding a heist on The U.S.S. Curtis Wilbur. My search led me to Rachel Sergi (right), who first caught my attention with Dario Argento-inspired The Suspiria, a potent little number she worked up using grain alcohol, which, by the way, was used as torpedo fuel by the U.S. Navy during World War II. 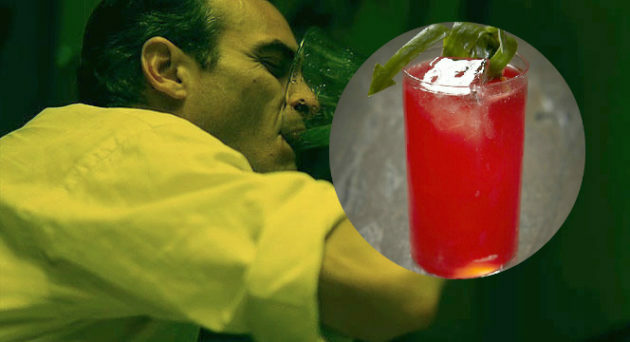 Sergi, who studied film at San Francisco State University, is Beverage Director at Jack Rose Dining Saloon in Washington D.C., and, after seeing The Master, she created the (Not So) Slow Boat to China exclusively for Movieline. She says the also-powerful cocktail, pictured at top, was inspired by the movie's maritime references and that weird little moment at the end of the movie where Philip Seymour Hoffman's Lancaster Dodd sings Frank Loesser's "(I'd Like to Get You on a) Slow Boat to China" to Freddie. Without further adieu, here is Rachel's most excellent recipe, complete with instructions on how to make the Pink Peppercorn tincture and White Pepper Syrup used in the drink. Now, get out your cocktail shakers and enjoy one. Build drink in mixing glass with all ingredients and ice. Stir to incorporate. Pour into rock glass with fresh cubed ice and garnish with lime peel (not flesh). Add the peppercorns to the 151 (in a plastic container) and stir. Allow to sit for 5 days, agitating each day to incorporate. After 5 days, strain the liquid into clean, glass bottles with either a cork or screw top. For use: Pour tincture into small tincture bottles for service. Bring saucepan to med-high and add peppercorns. Toast lightly…do NOT overtoast or burn. Take off heat. Add sugar and water. Bring to boil, then reduce by 1/4. Be careful doing next step: Strain syrup through chinoise into clean container. Allow to cool then place in quart containers marked with the item’s name and date. Keep in fridge. Follow Rachel Sergi on Twitter. Nice, but if you really want to try something closer to "torpedo juice", I'd recommend grain alcohol and pineapple juice, with some bitters (say, Bittermen's Grapefruit) to simulate Freddie Quell's paint thinner and whatnot. If you can get 190 proof Everclear, go 3 parts pineapple to 2 parts alcohol; if you can only get 151, go 1:1, or slightly less pineapple.